Now let’s talk about crust for a moment, shall we? I avoided making pies for years because I thought it was difficult to accomplish perfect pie crust at home. But it’s NOT difficult! To get a crust that’s both tender and flaky (which is what perfect pie crust is, right?! ), all you need is your fingers and good technique. As I mentioned last week in my King Arthur Flour recap, you want to cut half of your COLD fat into small pieces (generally butter and/or lard, though Nikki told me she’s had success with coconut oil when it’s solid), then work into the flour with your hands until the mixture looks like cornmeal. Yes, this can be done in a food processor but in the time it takes to drag one out and set it up (not to mention the time you’ll spend cleaning it), you’d be long finished if you’d just trusted your fingers. The rest of the COLD butter (or other fat) should be cut into larger pieces, dropped into the flour, and flattened down between your thumb and forefinger. Don’t work it in too much- visible butter is a good thing! I made a gluten free crust because not only did I want to test out my new pie crust making skills, I wanted to see if the above mentioned tips extend to gluten free pie dough. They do. To make this crust- which turned out to be fabulous- I used King Arthur Gluten-Free Whole Grain Flour blend. If you’ve got a favorite gluten-free flour blend, feel free to use it; you can also make this crust with all-purpose flour instead. Instead of rolling out the dough, I pressed it into each muffin cup and this worked well for me; I also pressed a piece of foil into each pie shell for par-baking purposes, so that the dough wouldn’t puff up too much. 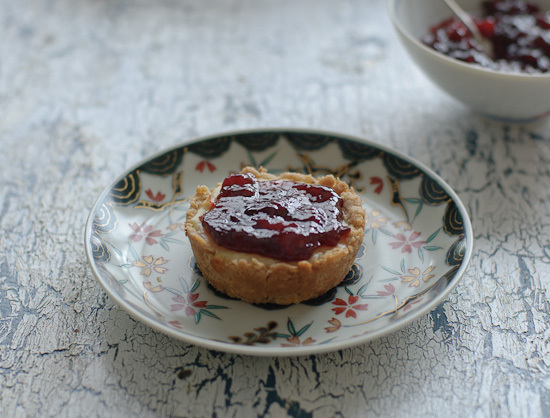 The idea for the cheese filling and the inspiration to top these with jam came from the recipe for Cheese Tart with Apricot Preserves which appears in The Preservation Kitchen: The Craft of Making and Cooking with Pickles, Preserves, and Aigre-doux . Ten Speed Press sent me this book to review and upon first glance, I thought it was too “cheffy” for me. I’ve formed a different opinion since studying it more carefully, however: it’s an exciting book filled with beautiful photos and ridiculously creative recipes. If you’re into preserving, I think you will love it. Last thing before I get to the recipe: I must tip my hat to Domenica, whose plum jam inspired mine. I love the lemon peel in this jam…it gives it a wonderful flavor and keeps it from being too sweet. I did not can my jam for shelf stability but you certainly “can”, if you like…follow Domenica’s instructions if you plan to do that. If you don’t want to make your own jam, go ahead and use any jam or fruit preserves that you have on hand to top these pies. The author of The Preservation Kitchen suggests sticking with stone fruits, but also mentions using a thin layer of lemon curd. If you already have a pie crust recipe you love, feel free to use it here...and if you'd rather bake this into a non-mini version, a tart pan with a removable bottom will work best. This recipe is seriously delicious, and I think it would be fun to serve these at a cocktail party. Or be like me and eat one for breakfast, snack, or dessert on any old day: you'll feel all "fancy" when you do. 1. Heat oven to 375 degrees F. Slice the plums in half and remove the pits, then cut the plums into smaller chunks. Mix in a bowl with 1/4 cup sugar and vanilla extract, then spread out onto a parchment lined baking sheet. Roast for 25-30 minutes, until the plums are lying in a pool of bubbly juice and are quite fragrant. 2. Carefully transfer roasted plums and roasting juices to a large, heavy-bottomed non-reactive pot. Add the rest of the sugar, the lemon peel, and the lemon juice. Bring to a boil over medium-high heat, then reduce the heat to low-medium, and cook for about 20 minutes, stirring occasionally. The jam will darken and thicken quite a bit during this time. 3. Ladle jam into jar(s) and refrigerate (leave about 1/2 cup out if using to spread over the pies sometime soon). The jam is easiest to spread when it's still warm, so if you've made it ahead of time, warm it in a pot on the stove (or in the microwave) before spreading it over the pies. 1. Whisk together the flour blend, sugar (if using) xanthan gum (if using), and salt. 2. Take half of the butter (3 slices) and cut these pieces in half once more. Work these small pieces into the flour mixture until it's crumbly "like cornmeal", with some larger, pea-sized chunks of butter remaining. 3. Take the remaining butter and work it into the flour with your fingers by flattening the butter pieces down between your thumb and forefinger. You should be able to see pieces of butter "about the size of dried cranberries" in the flour. 4. Sprinkle lemon juice over the flour/fat mixture and mix until dough begins to come together. Add ice water 1 tablespoon at a time, if necessary, to bring the dough mass together. 5. Dump dough out onto work surface and shape into a ball. Flatten into a round and wrap tightly in plastic wrap, then refrigerate for at least an hour, or as long as two days. 6. When you are ready to bake the pies, preheat the oven to 400°F and butter ten regular-sized (2 3/4- 3 inch diameter) muffin cups. 7. Remove chilled dough from the refrigerator, then allow to sit at room temperature until it's pliable (10-20 minutes). Unwrap the dough, then divide it into 8-10 equal pieces (I went with the 8, but I think I could have made the shells thinner if I wanted to make 10). 8. Press each piece of dough firmly and evenly into a muffin cup (you could roll the pieces out first, but I chose not to and it worked out just fine), then lightly prick the bottom of each shell with a fork. 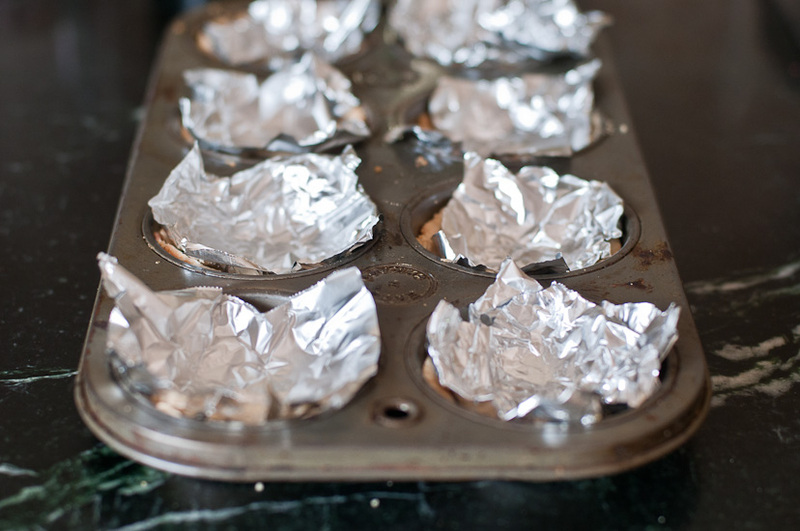 Cut small squares of foil so you can press a piece into each one, covering each mini pie shells. 9. Bake for 10-12 minutes, until the dough is pale golden in color. Set the pie shells aside to cool while you make the filling, and decrease the oven temperature to 350 degrees F.
1. Place all filling ingredients in a blender and process until smooth (you could also use a stand mixer fitted with a paddle attachment, or a food processor to do this). 2. Pour filling into par-baked pie shells (don't overfill them). Bake the mini pies until the tops are set and a bit puffy, about 20 minutes. You will have some filling left over, especially if you only make 8 pies...you can bake the leftover filling in buttered muffin cups "crust-less", if you like. 3. 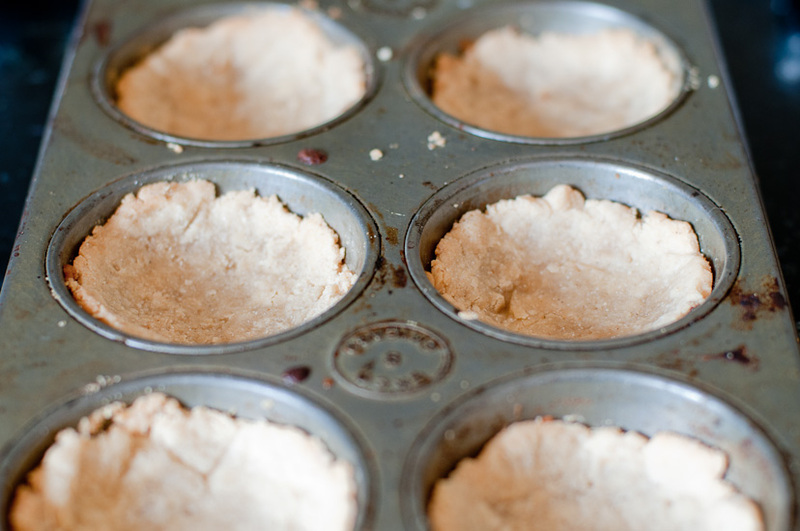 Allow the pies to cool down before running a sharp knife all around the edges and gently removing from the muffin tins (if you do this too soon, the crusts may be too crumbly to remove in one piece). Spread with jam while the pies are still warm. Pie crust recipe adapted from King Arthur Flour and Abby Dodge; cheese filling adapted from The Preservation Kitchen: The Craft of Making and Cooking with Pickles, Preserves, and Aigre-doux ; plum jam adapted from Domenica Cooks. what a great idea, Winnie! Winnie, The goat cheese fillings sound killer and jam topping is the perfect compliment. I’m so happy to could bake with all of us this month!! 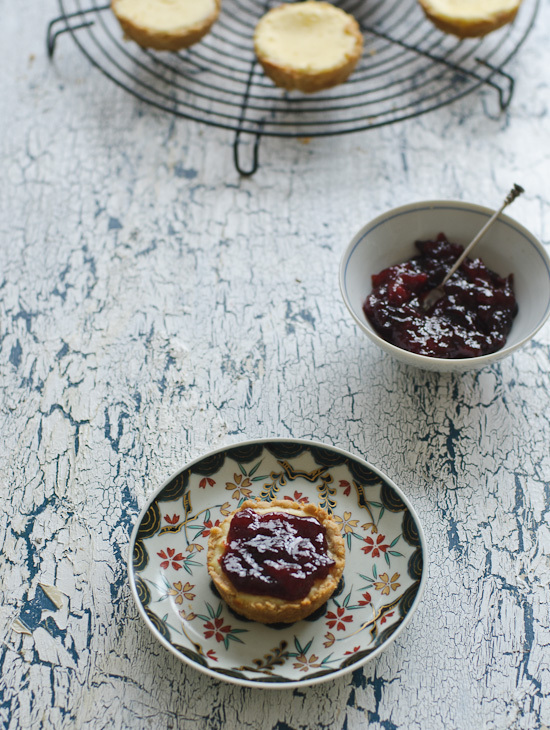 I love these mini pies and the roasted plum jam sounds divine! I can’t wait to make mini pies. They are the cutest dessert for summer. Yours look delicious, how can they not be with that cream and goat cheese and that fabulous roasted plum jam! These are wonderful — and it’s good to know that making the crust gluten-free still delivers the results using the techniques you’ve described. 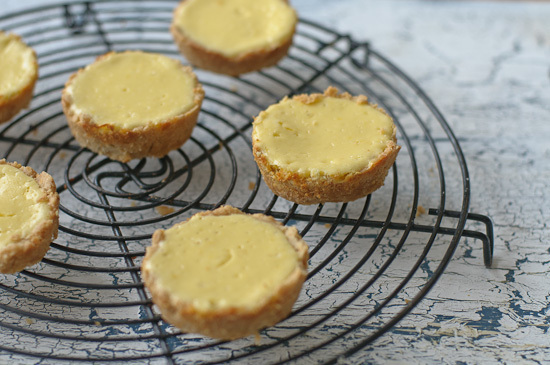 One of my grown sons is gluten intolerant and I like to be able to make a treat for him when he comes for dinner :) Gorgeous little tarts — love the citrus in that yummy jam. Ooo, I love these. First, they’re adorable. I love pies in muffin tins and mason jars or anything that makes them mini. Also, I love the goat cheese filling- that tang makes a dessert walk the sweet/savory line in just the right way. Super yum. They are wonderful and adorable! I love making piecrust and agree that it is pretty easy. I love the mini pies, too, now. And I must try this fabulous cheese filling! 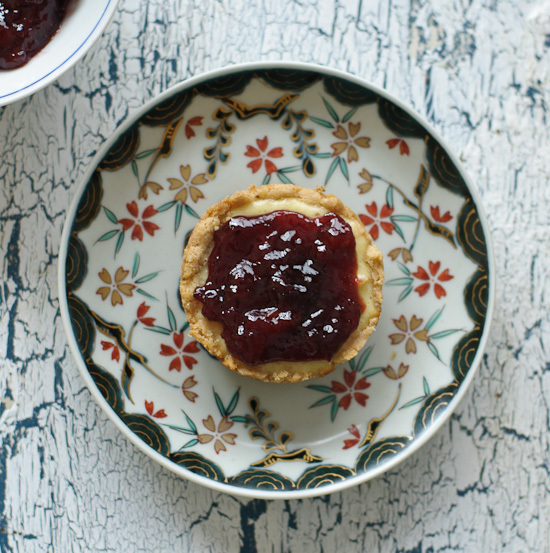 I know that goat cheese goes so well with fruit jams so your serving these tarts with jam must be so good. Great recipe, Winnie! Happy Pie Day! Your cheese pies are beautiful, Winnie. 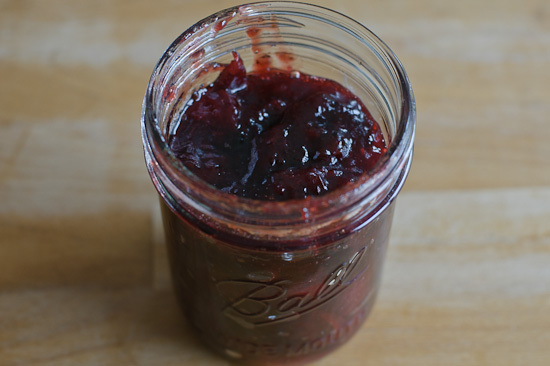 I love the idea of roasted plum jam. Lovely post! Such cuties! I love their plummy tops, and goat cheese makes for the most complex and tangy cheesecakes – yum yum! Plums and goat cheese, together?!?! In a little pie!!! Love! These look delicious and I love that little plate – so much character. Wow!. Can’t wait to try out this recipe. Thanks. Oh! These look lovely! I am still scared of pie crust though…maybe one day I will have the courage to attempt it! These sound divine. I can’t wait to try them myself.